Divided Attention Test is meant to assess your capacity for concentration and multi event awareness. 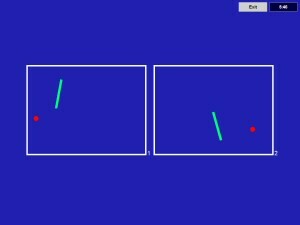 Sets of screens are displayed on your monitor in each of which a dot and a bar circulate independently from each other at random direction and changing speed. You are to watch the screens narrowly and respond whenever a dot and a bar intersect with or contact each other (critical event) by clicking the number on your keyboard assigned to the screen in which this event happened.